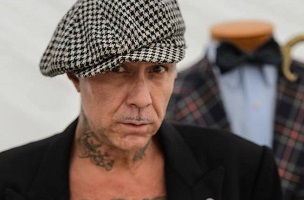 We pay tribute this morning to Michele Savoia, a fashion designer who was reported missing in New York City last Thursday and whose body – very sadly – was found over the weekend, floating in the Hudson River. A close friend, Kevin James Dalton, said it appeared that Mr. Savoia slipped on the aluminum ramp leading to his boat at Pier 59 and fell into the near-freezing water after a night of partying. In the video interview above, done in 2011 for website StylelikeU.com, Savoia explains that he originally wanted to become a cartoonist. The 55-year-old designer made suits for celebrity clients like Robert De Niro and contributed costumes to Broadway shows such as Evita, Swing and Promises, Promises. Friends, colleagues are currently sharing memories on Savoia’s Facebook page. He leaves behind a daughter, Gabriela. RIP.